We love the freedom that decorating with custom wallpaper gives you. With custom wallpaper, you aren't constrained by pattern books and swatches; most any image can dress your walls as you see fit, as opposed to how others think you should decorate. With this in mind, we encourage people to think outside of the box and paper their walls with unexpected looks. Hence, we offer today's custom wallpaper imagery inspiration. Patinas occur when objects such as metal and wood are exposed to the elements, oxygen and water. This exposure leads to unpredictable but beautiful chemical color changes on the surface of such objects. Greenish copper patinas are perhaps the most recognizable, like the look of the Statue of Liberty. We suggest that you carry over this look as a custom wall mural. The mural in the inspiration room features not only a patina copper, but ridges and divots in the metal as well. The random streaking and discoloration makes the mural look like an over-sized abstract painting. The perfect splash of color and interest for a neutral decor scheme. The same effect can be achieved with even richer tones with rusts, which can vary from orange and brown. 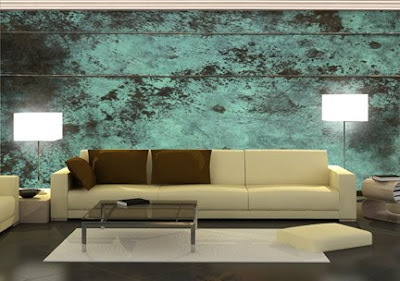 The end result being an elegant custom wallpaper with just the right mix of an industrial attitude.